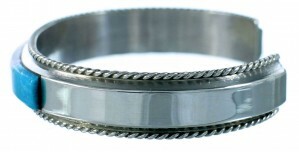 This is truly an outstanding bracelet that will make a great impression! 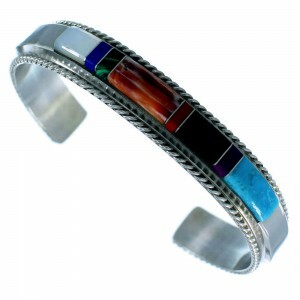 This piece of Native American jewelry is Navajo hand crafted by artist Francelita Yazzie out of genuine sterling silver and real multicolor inlay. 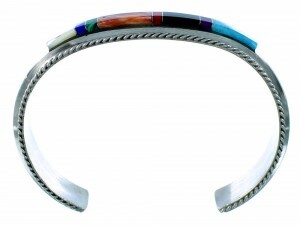 The inlay consists of: Turquoise, Coral, Jet, Red Oyster Shell, Malachite, Lapis, Sugilite, along with Mother of Pearl. 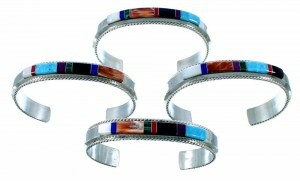 The inlay is carefully set, while thin silver lines can be seen accenting for a beautiful look. 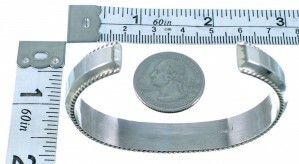 This bracelet is stamped sterling and hallmarked.